We at Corsair Diving Malta pride ourselves on our quality of teaching and our reputation for producing certified divers who have the highest levels of skills and confidence in their own ability. We teach PADI courses as PADI (Professional Association of Diving Instructors) is the world's largest and most respected scuba diving training organisation with an international reputation for high class scuba diving education. PADI courses are designed with the aim of making learning both enjoyable and worthwhile ensuring that as a certified PADI diver you have mastered all the skills required to become a safe and competent diver and your certification will be recognised worldwide. All courses taught at Corsair Diving Malta from your very first Discover Scuba Diving course, Open Water course, Advanced Open Water course or Specialty training will be completed under the expert tuition of an experienced PADI Instructor. We can organise all scuba diving courses beginning on any day of the week and throughout the year to suit your personal needs and timescales. All our courses are completed with small groups and you will often find you have your own personal instructor to ensure that our quality is always at its highest and your personal experience of Malta Diving is prioritised. Please be aware that all our prices outlined below include absolutely everything you need to gain certification in whichever of the PADI courses you choose. This means that the price includes all learning materials required, full equipment hire, transport to and from the Malta Diving sites, your PADI Instructor, certification fees and a free hotel pick up in the local area. With Corsair Diving Malta there are no surprise hidden extras! A special introductory scuba diving course designed especially for those aged between 8 and 10 years old. You will experience Scuba Diving for the first time in a shallow calm area of Malta's stunning Mediterranean Sea alongside your PADI Instructor. Due to the ages of participants, numbers are restricted to 2 people per PADI Instructor. Course consists of a short lesson and kit demonstration followed by one dive. Expect the course to take approximately 3 hours. Experience the underwater world for the first time in Malta's stunning Mediterranean Sea with a Discover Scuba Diving course. This is the perfect family activity for your diving holiday. You will take part in a short lesson with your PADI Instructor before your dive teaching you all about the equipment you will be using, the sea you will be in and most importantly how to enjoy your experience to the fullest. You will then head to one of our dive sites to put your learning into practise alongside your PADI Instructor and enjoy the delights of Malta diving. This scuba diving course will provide a temporary license meaning you can enjoy diving Malta with us again for up to 1 year. 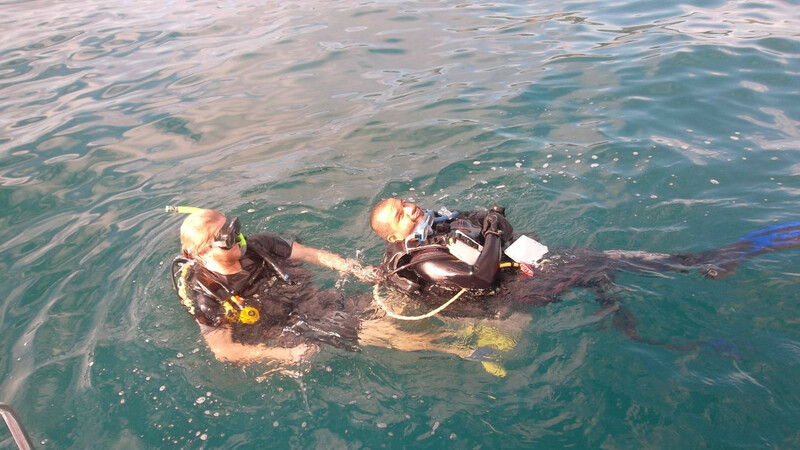 It can also be credited towards your Open Water PADI courses. Extra dives will cost €40 each. The Scuba Diver course is for those limited on time during their diving holiday but keen to gain a full scuba diving certification. 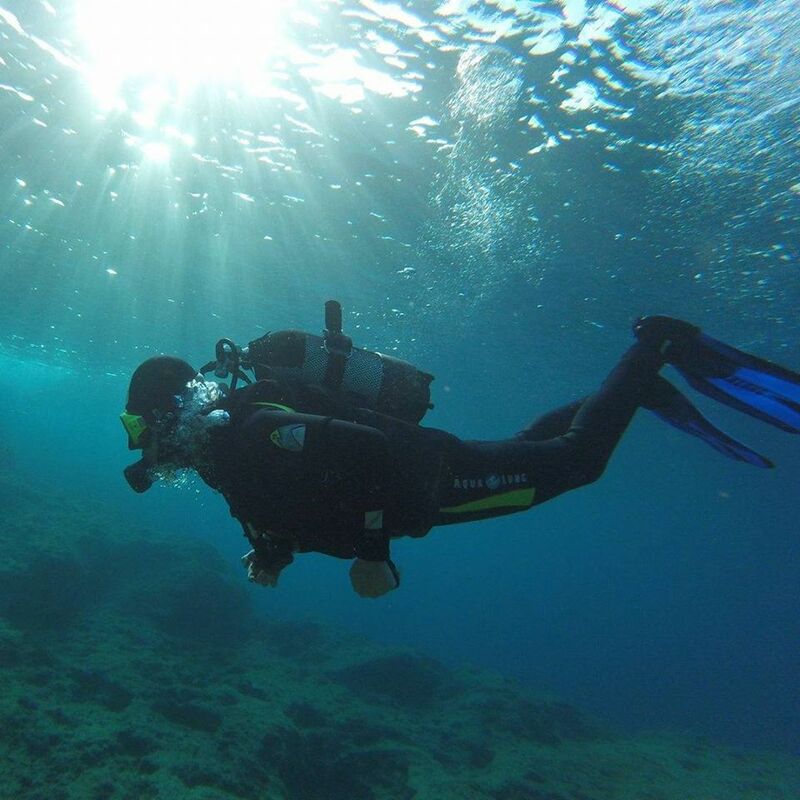 This PADI course consists of the first 2 days of the full Open Water course, you will complete 3 theory sessions, 3 confined water sessions and 2 open water dives to a maximum depth of 12 metres. After certification you will be qualified to dive anywhere in the world to a maximum of 12 metres alongside a qualified professional. As always this scuba diving course is taught by an experienced PADI Instructor. The Open Water Course is your first comprehensive scuba diving qualification. It consists of 5 theory sessions, 5 confined water sessions and leading on to 4 open water dives, putting your new skills to use while enjoying Malta diving. You will progress to your certification limit of 18 metres and after qualification will be able to dive anywhere around the world. The course will take 4 days, with days 1 and 2 spent learning your theory and practising your skills in shallow confined water before finishing with 4 dives spread across days 3 and 4. You will dive at some of the best spots Malta diving has to offer and by the end of the course be a safe and competent diver. Complete your theory section online before your arrival with us in Malta to save time for the good things during your diving holiday. Your Open Water course will then take 3 days, day 1 spent in shallow confined water learning skills before putting these skills into practise with your 4 open water dives on days 2 and 3, progressing to a maximum depth of 18 metres. You will dive at some of the best spots Malta diving has to offer and by the end of the course be a safe and competent diver. After certification you will be able to dive anywhere in the world to a limit of 18 metres. Have you completed your theory and confined water sessions at home? Finish your Open Water course with us at Corsair Diving Malta by completing your 4 final open water dives to gain your certification. We will visit some of the best diving sites Malta diving can offer to put your newly learnt skills into practise, progressing to your certification limit of 18 metres. Pre-requisites: You must be a certified (Junior) Open Water diver or equivalent to enroll in this course. Looking to progress your diving ability? PADI's Advanced Open Water Course will build on the information you learnt in your Open Water Diving Course. It focuses on specialist areas of scuba diving training such as Deep Diving and Wreck diving. The course consists of 5 dives taught across at least 2 days and each of these dives has a theme. Deep Diving and Underwater Navigation are compulsory however you can choose the other 3 themes to suit your interests. Popular choices in Malta include Wreck Diving, Peak Performance Buoyancy, Night Diving and Dive Against Debris but there are many other options too. Get in touch with the dive centre for the full list. Limited on time or not wanting to complete the full Advanced Open Water Course? PADI's Adventure Diver Course allows you to increase your diving knowledge and enjoy 3 more dives to build your skills after your Open Water certification. This course can be taught in only 1 day and you will be able to choose which themes you would like your dives to follow to suit your interests best. Popular choices in Malta include Wreck Diving, Peak Performance Buoyancy, Night Diving and Dive Against Debris but there are many other options too. Get in touch with the dive centre for the full list. Pre-requisites:PADI Advanced Open Water diver or equivalent. Must hold a current certificate for CPR and First Aid, such as the Emergency First Response - Primary and Secondary Care. Course must have been completed within the last 2 years and can be taught at the dive centre if required. Looking to increase your personal comfort in the water and wanting to take more responsibility for you and your buddy underwater? The Rescue diver course is one of the most informative and fun PADI Courses. The Rescue Diver course will teach you about the psychology of rescue, being prepared for diver emergency, accident management and responding to diver emergencies. The course starts with 10 rescue exercises, teaching you the skills required to prevent and respond to potential diver emergencies. You then finish with 2 open water rescue scenarios which will put these skills to test in simulated real life scenarios. This non scuba diving course is designed for anyone who would like to feel more comfortable with their first aid skills. We all hope our help will never be needed but it is always reassuring to know that if anything happened to any member of your family, a friend or even a stranger in the street that you would be comfortable in your skills and able to assist and potentially even save their life. The primary case section of the course deals with CPR, barrier use, bleeding, shock and spinal injury management. The secondary care section goes through injury and illness assessment, bandaging and splinting. We also provide training on Automated External Defibrillation which detects and gives a shock when needed, to restore a normal heart rhythm. AED's are now found in a lot of public areas, and are an invaluable piece of equipment during CPR. Both primary and secondary care courses are needed for the Rescue Diver certification. Complete two boat dives with us here at Corsair Diving Malta during your diving holiday and whilst doing so, learn about the special skills required to safely run a boat diving day and dive from a boat. Learn about the extra safety equipment needed, the correct terminology for areas of a boat and the differing entry and exit techniques. Looking to progress your diving deeper and access more dive sites? Complete the Deep Diver Specialty PADI Course and learn about the extra considerations when diving to depths of 40 metres. Learn more about Narcosis, Decompression Limits and Safety considerations while completing 4 dives to some of the deeper spots Malta diving offers. Got a new underwater camera and looking for some advice on how to get the sharpest pictures? As keen photographers ourselves we can guide you through the best methods to get clear and sharp images, displaying bright colours and including lots of natural light. A great way to improve your diving holiday pictures and create some great holiday mementos. Love the ocean? Keen to help protect it? Complete the Dive Against Debris specialty PADI course with Corsair Diving Malta and not only complete an underwater clean up alongside your PADI Instructor but learn how to report your findings at the dive centre and learn how to plan your own clean ups and help to save the ocean! Bought a new drysuit? Keen to understand it better and gain confidence before going on dives? Complete your Drysuit Specialty and alongside your PADI Instructor practice your new techniques for buoyancy control, emergency drills and finning techniques. A great way to prepare for the winter months. As equipment technicians, we can teach you about routine care and maintenance procedures as well as scuba equipment storage recommendations. Your PADI Instructor will show you how to overcome some common equipment problems and offer equipment configuration suggestions. Find yourself constantly asking … what was that fish? The one with the yellow head and red body? Well take the Fish ID specialty course and learn all about the marine life you see whilst diving Malta. Learn to identify different marine life, the families and learn interesting facts about the life you see. Did you know that Octopus have 3 hearts? Want to help out more around your club back home? Want to learn how to fill your own cylinders? You’ll learn the properties of oxygen, how best to handle it and the associated hazards. Finally you will learn the differing methods of creating your desired EANx gas mix. Wanting to understand how to plan your dives fully and understand how your computer works? The Multilevel specialty will help you better understand decompression theory, dive computer models and how best to plan your dive to maximise your no decompression limit. The Underwater Naturalist Specialty will teach you about the ecology and ecosystems you will find whilst diving Malta. How different creatures interact and will help you to notice how best to limit your impact on the underwater environment. Keen to improve your personal diving awareness? Wanting to know where you are going when scuba diving? Complete the Navigation Specialty PADI course and learn the skills we as dive guides use to help navigate around dive sites. Learn about proper compass use and natural navigation methods which can ease your comfort underwater. Night diving is completely different to scuba diving during the day, you will see a huge difference in the abundance of marine life and the variety. 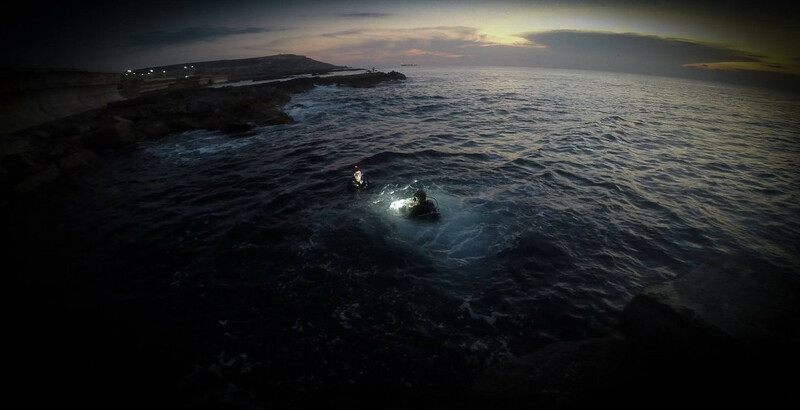 Complete 3 night dives as part of your specialty and learn about the major differences such as safe torch use, navigation at night and the extra safety considerations. Looking to spend longer at depth underwater? Reduce the lengths of your surface intervals? Or aiming to feel less tired at the end of each day? These are only 3 of the benefits of using an enriched air gas mix, complete the PADI Nitrox Specialty and learn how to safely use and dive with a Nitrox mix. Knowing how and when to use emergency Oxygen is a great skill to have and means you’re ready to help others should the need arise. You will learn about dive injuries, different types of emergency Oxygen equipment and the safety considerations required in its use. You will also practise how to administer emergency O2 so you are prepared and confident if ever you need to use it. Buoyancy control is the key to diving, it improves your efficiency, improves your air consumption and most importantly increases your comfort in the water. Complete the Peak Performance Buoyancy PADI course and learn about proper weighting, finning techniques and perfecting neutral buoyancy. The one course that will always improve your personal diving. It happens: People accidentally drop things from docks, off boats or even while scuba diving. If you’ve ever lost something in the water and wanted to go find it, then the Search and Recovery Diver Specialty PADI course is for you. There are effective ways to search for objects underwater that increase your chances of success. And there are good and better methods to bring up small, large or just awkward items. Search and recovery can be challenging, but a whole lot of fun. Shipwrecks, whether purposely sunk as an artificial reef or lost through accident or disaster are potentially hazardous environments. The Wreck Specialty PADI course will teach you how to identify hazards, how to navigate safely around a shipwreck and how to safely penetrate a shipwreck ensuring visibility is not disturbed and ensuring disorientation is never an issue. A must do course for all wreck fanatics!